The Quantum Fitness Q-3.3 ESD treadmill is used in hospitals and in corporate gyms, which should give you an idea of its high-end commercial performance. If you want a solid machine but don’t want to spend an outrageous $6K-$8K on a health club model, an award-winning Q-Series treadmill seems like a good choice. The console on the Quantum Fitness Q-3.3 ESD treadmill has a tri-color, 3-window LED display to show speed, time, distance, pace, laps, heart rate, calories, cal/hour, and incline. Along with a Quick Start feature, it offers 16 Program workouts, 12 Custom Programs, and Fitness Test. The low-RPM and cool-running 4 HP continuous duty direct-current (DC) motor has coated/sealed electronics, an internal cooling fan and a club rated controller. Along with a sturdy steel frame, the Quantum Fitness Q-3.3 ESD treadmill has a quiet low friction belt, 2.5" precision machined and balanced OD rollers with sealed bearings, a 1-1/32” reversible Phenolic deck and Dual Zone suspension system to provide the best in impact-absorption. Other features of the Quantum Q-3.3 ESD include large 2” OD handrails, low step-up floor height for easy mounting, and rehab-oriented features. Many Quantum Fitness treadmills are used for medical stress testing in clinics which is why this machine is also listed for light commercial use as well as residential. The treadmill reviews by current users on this beauty are quite favorable. Prices on new Quantum models range from $3,299 to $3,899 and come backed by a warranty of 5 years on parts and one-year on in-home labor. 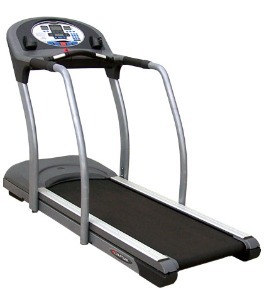 Prices on a remanufactured treadmill of this model will be less than $2,000. At the full price of well over $3,000, we would rather go with a Life Fitness Club Series, Cybex, Landice, or True treadmill. Those manufacturers are well represented by local specialty dealers who have certified technicians to service your high-end treadmill. Because Quantum Fitness is struggling to make a dent in the home market, their treadmills are difficult to find to buy, even online. Would they have a service rep in your area to assist you if there is a problem? The Quantum Fitness Q-3.3 ESD treadmill is a quality machine, but without some sound indication that Quantum wants to continue fighting for residential customers, we would go with an equal or better treadmill from a leading brand instead.